The announcement last month that Lada will finally stop building the 2107 (also called the Riva) was sad news. At least sad to those of us perverse enough to love the idea that the 1966 Fiat 124 was still in production somewhere. 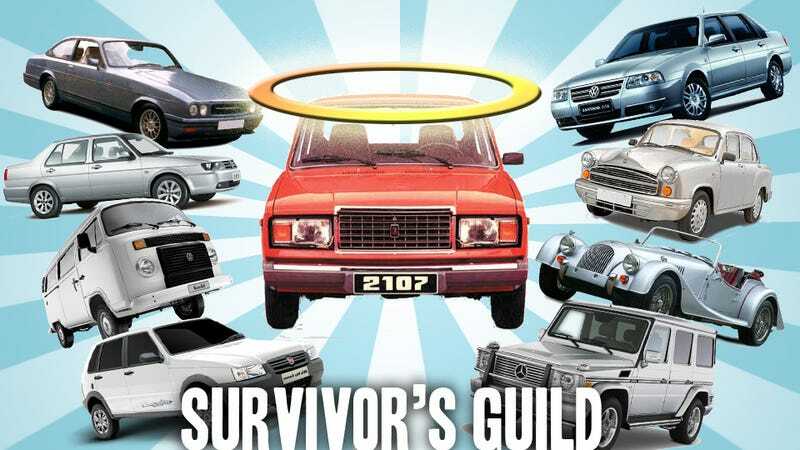 That Lada was part of an ever-shrinking club of true automotive survivors. Let's see who's left. To qualify in this exclusive geezer group, the car must be built on a platform at least 25 years old. Engines can change, there can be facelifts, new materials, new names, whatever, but the fundamental platform must still remain the same. So, yes, while there've been Mustangs and Corvettes and Suburbans so on since the 60s, it's not the same car, just the same name. So those don't count. The past decade or so has been a rough one for long-lived platforms. Many old favorites met their ends, like the Volkswagen Beetle and original Golf (ending in 2003 and 2009 respectively), Ford's Panther platform (RIP 2011), Peugeot 504 (gone in 2006), Jeep Cherokee (expired 2005), and the Fiat 128 (as an El Nasr, 2009). Still, despite the recent carnage, there's still a good group that just won't die. Here they are, along with my survival speculations. Morgan 4/4: Though the car started production in 1936, the one built today is really a descendent of the Series II from 1955. It's been updated mechanically quite often, but it's still the same wood-framed tweedy sportster from way back when. This one has a very good chance of keeping going for another 25 years, because it's longevity is based on tradition, not economic reasons. 95% chance of going through the decade. We'll still see these when they're running on captive black holes and we're all gorged on Soylent Green. Hindustan Ambassador: Based on the 1958 Morris Oxford, the Amabassador put India on wheels. An Isuzu engine motivates it now, and the body is wonderfully archaic. I'd love to have one of these. It's got a long heritage, but I'm a bit afraid for its longer-term survival. The triple killjoys of environmental responsibility, increasing cheap competition, and driver safety are always looming, ready to pounce. I think the Amby's got about a 25% chance of making it out of this decade. Volkswagen Kombi (Type II): Incredibly, the original Microbus (technically this is a 2nd generation T2, starting from 1967) is still available from Brazil, though the motor crammed under the back floor is water-cooled and can run on gas or ethanol. Aside from the afterthought-looking radiator grafted on the nose, this looks pretty much like it did 40 years ago. I actually think in its home markets, the old Bus has a decent shot of soldiering on a bit longer. There's been plenty of competition that's tried and failed to beat it from a price-to-utility standpoint. I say 70% odds of it making through the decade. Bristol Blenheim (Type 603) This car is like a vampire that lives on snobbery instead of blood. First built in 1976, you can still buy a Blenheim, provided you've got around $250,000 and a staggering blindness to massive panel gaps and outdated technology. Notoriously difficult to drive or test outside of the walled garden of self-deluded classists, I think these will actually keep getting made. Not because anybody really wants what amounts to The Finest Ford Capri Available, but more so because they build so few, they may as well keep it up. 75% chance these have at least another decade of brand snobbery to go. Mercedes-Benz (or Puch) G-Class: The Shah of Iran suggested this to Benz back in '79, and they've been making them ever since. They've been updated under the hood and gotten more and more luxurious over the years, but it's still the same big, boxy Austrian brute. It just wears fancier suits now. Benz did a pretty comprehensive update for 2013, so I think there's still life in the G-Wagen. I say 85% chance of it going at least through 2020. Fiat Uno (1st Generation) The boxy little Italian from 1983 is still sold in Brazil as the Mille Economy, and while it's had a good bit of freshening, it's still pretty clearly an '80s car. This low-end market segment is very competitive, and it's only still here because it's in that sweet spot of cheap to produce and run, but any number of later generation brothers could easily kick it out of its spot. I think it's got a few more years, but probably not enough to ride out the decade. 30% chance of making it to 2020. Volkswagen Jetta (2nd generation, 1984) and Volkswagen Passat (2nd generation, 1981): China's loved these VWs for a long time. The Santana/Passat has been a staple for decades, serving as family cars and cabs and police vehicles– it's sort of like China's German Crown Vic. Both the Jetta and Passat have received pretty recent refreshings, so I bet they've got some more life in them. China has a growing middle class, and either of these cars likely still has a good market. I'm going to say they're 65% likely to live through the decade. Peugeot 405 (IKCO Samand): This old 1987-era Gaul is still getting built and updated in Iran, where it has the dubious title of National Car. It's still a viable lower-end car, though I'm not so sure how long it's really got. This one's a toss-up for surviving the next seven or so years. Am I missing anything? Probably. But that's what commenters are for, right?